These events involve a lot of donated time from a lot of individuals and donated materials and services from local companies, but it still cannot happen without financial contributions, too. Please put “CIDC donation” in the Designation box. Of course, we appreciate all donations, but to boost our efforts to cover expenses, we have three leadership donor levels and we are hoping that you will show your support by becoming a lead patron this year. For a gift of $500 or more, we will prominently display your company banner you provide at the entrance to the park during the event, identify your patron status in the Crozet Gazette and event handbill and provide you with ten passes to the celebration in the park. For a gift of $250, you will receive acknowledgment in the Crozet Gazette and event handbill and four passes to the celebration in the park. And, for a gift of $100 you will receive two passes to the celebration in the park, published thanks in the Crozet Gazette and the event handbill. July will be here before you know it. Won’t you join us by contributing whatever you can afford? If being a lead patron is too much this, please send whatever you can afford. Your contribution is tax-deductible charitable donation. Thank you! You can mail a check payable to: Downtown Crozet Association and send it to: DCA, P.O. Box 863, Crozet, VA 22932. Please put “CIDC donation” on the memo line. It takes a village – won’t you help out on Saturday, July 2 for an hour? We need your help for just an hour or two on Sunday, July 2. 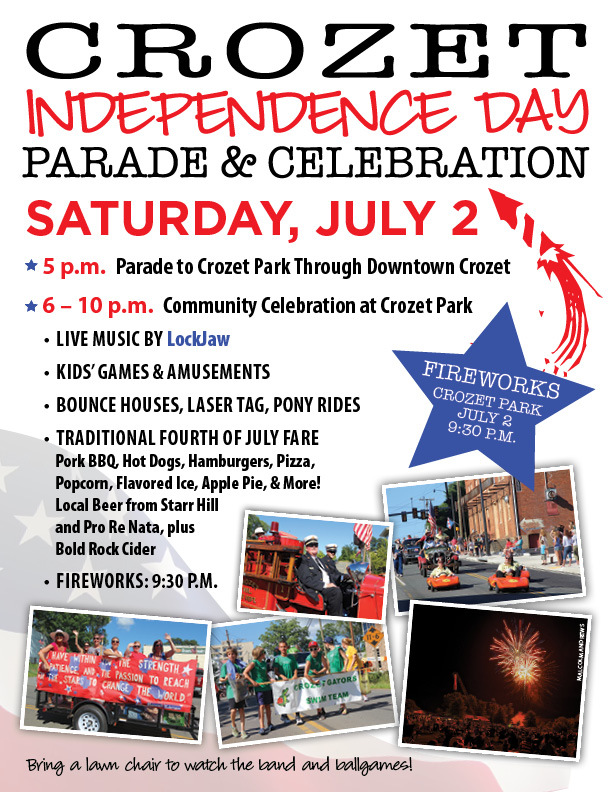 Below is the website to sign-up to help with the Crozet Independence Day Celebration (CIDC) next Sunday, July 2, between 5PM to 10PM. There are a variety of tasks and time slots. Most of the time slots are only an hour – so there’s lots of ways to help and still enjoy the event. When you sign-up it will ask for your name, email and, optionally phone number. No one else can see your email and phone. We promise we won’t share it. It’s helpful for us to have it if something happens and we need to let you know about a last minute change. We urge church groups, civic and neighborhood associations to sign-up. Crozet Trails Crew already has volunteered to staff one spot the whole evening! Let’s see which group can have the most volunteers! 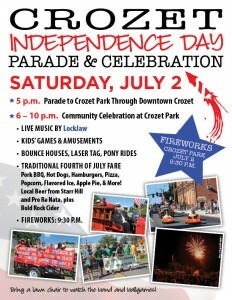 With your help, we can make this Crozet Independence Day celebration the best ever! 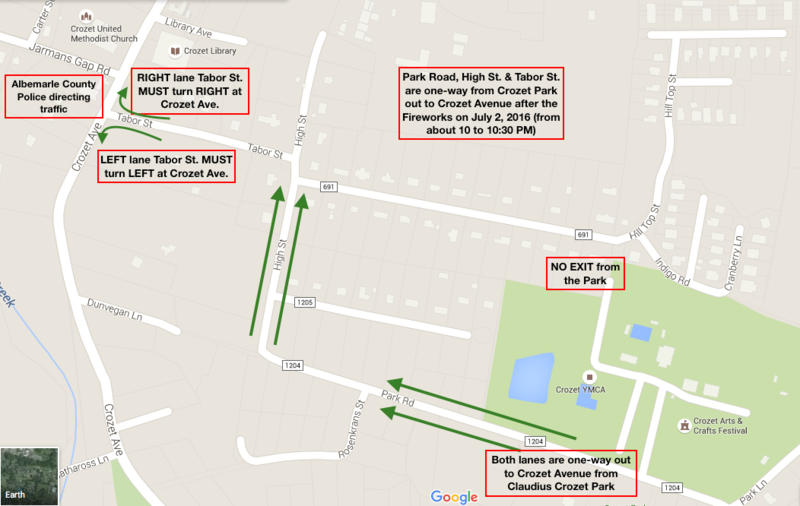 New this year, BOTH LANES of Park Road, High Street, and Tabor Street will be one-way out from Claudius Crozet Park to Crozet Avenue after the fireworks (from about 10 to 10:30 PM). See the map below for details. Please note these traffic disruptions as you make your plans for Saturday, July 2. It all starts with the Crozet Volunteer Fire Department (CVFD) parade at 5:00 PM at Crozet Elementary School and goes down Crozet Avenue through downtown Crozet to Claudius Crozet Park. The Parade Grand Marshals are Pete and Rick Maupin and we hope that the Richmond Shriners’ ACCA Mini-Patrol cars are one of the many entries in the parade. If you would like to be a part of the 2016 Crozet Fireman’s parade, please submit your entry to be in the parade as soon as possible to ensure you are included in the lineup. Lineup will be based on a first come basis. Horses/livestock will be placed near or at the end of the parade. Lineup will begin at 4:00 P.M. at Crozet Elementary School and the parade ends at Claudius Crozet Park. This year’s Grand Marshals are Pete and Rick Maupin, in recognition of their contributions to our community. There will be field judging for Fire & Rescue apparatus at Claudius Crozet Park after the parade. Awards will be presented around 7:00 P.M. The celebration begins at Claudius Crozet Park after the parade, where there will be live music by LockJaw, a local cover band that plays classic rock, blues, and R&B, as well as free rides and games for children. Bring a lawn chair if you want to be comfortable as you watch the events. Traditional American Fourth of July fare will be available, including pork barbecue, hot dogs, hamburgers, pizza, popcorn, apple pie,and sno cones, as well as vegetarian and vegan choices, tacos, and other favorites such as pizza and fruit smoothies. Starr Hill & Pro Re Nada Beer and Bold Rock Cider will also be on hand. Pam Garrison will MC the event. Event culminates at 9:30 PM with a stupendous fireworks show. (We have it at 9:30 PM so it’s late enough to be dark, but not too late to for the youngsters to view the show.) Also, there are no pets allowed in the event and we’ll provide designated smoking areas and ask that you only smoke in those areas. If you live nearby Crozet Park, we encourage you to walk! These events involve a lot of donated time from a lot of individuals, but they can’t happen without financial contributions, too. Of course, we appreciate all donations, but to boost our efforts to cover expenses, we have three leadership donor levels and we are hoping that you will show your support by becoming a lead patron this year. We need your help for just an hour or two on Saturday, July 2. Below is the website to sign-up to help with the Crozet Independence Day Celebration (CIDC) next Saturday, July 2, between 5PM to 10PM. There are a variety of tasks and time slots. Most of the time slots are only an hour – so there’s lots of ways to help and still enjoy the event. On Saturday, July 2, from about 10 to 10:30 pm (after the fireworks show) BOTH LANES of Park Road, High Street, and Tabor Street will be one‑way from Claudius Crozet Park to Crozet Avenue. Albemarle County Police officers will be directing traffic at the Crozet Avenue/Tabor Street intersection. 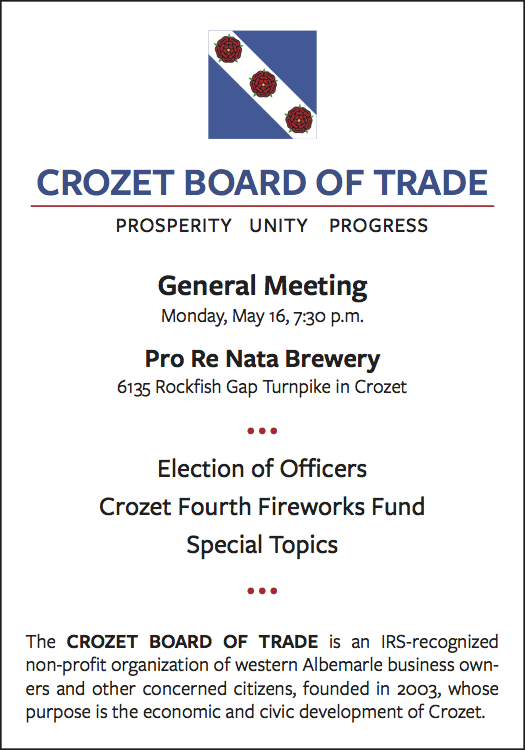 Wednesday, May 18, 2016 from 7:00 p.m. to 9:00 p.m.
Crozet Board of Trade meeting on Monday, May 16, 2016 at 7:30 PM at Pro Re Nata brewery, Crozet. Milestone Partners has posted a request for proposal from land planning and landscape architect firms for design of the downtown plaza project (to pick a design architect). Pursuing 501(c)3 status for the CCA and grant applications. Crozet Car Show, Saturday, May 21, 9AM to Noon in Old Trail Village, Crozet. Vehicle Registration $20; for details email: SamHarris08@yahoo.com (Rain Date: May 22) Proceeds benefit the Albemarle County Police Foundation. Cancelled due to predicted inclement weather, Old Trail business considerations, volunteer requirements on Sunday, etc. Will be re-scheduled to September. Join our email list, by clicking on the “Contact Us” link on the top of this page. Thursday, May 5, 2016 from 7:00 p.m. to 8:00 p.m.
3b. Kyle Redinger’s May 2, 2016 response to CCAC concerns. Next meeting of the CCAC is their regular monthly meeting on the third Wednesday of the month, on May 18, at 7:00 PM at the Crozet Library. 36th Annual Crozet Spring Arts and Crafts Festival! Come to beautiful Claudius Crozet Park for the 36th Annual Crozet Arts and Crafts Festival, featuring over 100 juried Fine Art and Craft Exhibitors and so much more! Meet the makers of unique decorative, functional, wearable, and fantastically imaginative creative works including furniture, jewelry, clothing, bonsai, paintings, photography, toys, and many others! A beloved and well-supported tradition in Albemarle County, the Crozet Arts and Crafts Festival supports local and national artists, musicians, and food vendors, as well as being the main source of revenue for the non-profit, community owned and operated Claudius Crozet Park. Special Spring Festival activities include craft demonstrations on the wood lathe with Tony DeMasi and raku pottery firing with Bashar and Roula Jarjour, interactive silk scarf dying with Shibumi Silks, and Mother’s Day mini-photo sessions with Crozet-based photographer Simple Will Photography. Crozet Arts & Crafts Festival Needs Your Help! We are in need of volunteers for many areas of the Festival – from grounds maintenance to Exhibitor booth-sitting and more. Volunteers will receive Festival admission for the full day, and the satisfaction of playing an integral part in the ongoing success of this fantastic weekend celebration of art, craft, and community at Claudius Crozet Park. As the major fundraiser for the community-owned and operated Claudius Crozet Park, the Festival plays a vital role in the survival and growth of this Albemarle County gem. Come be a part of it! An extra perk, you get free admission to the festival just for donating your time!